Allen and his wife Beverly joined the club in the early 90’s. There were excellent modelers and very active in all aspects of the club. 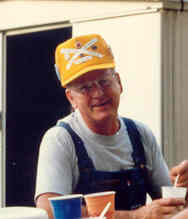 Allen served as Club President in 1990 and 1992 and as Vice President in 1991. Allen and Beverly travelled together to and photographed the Rio Grande River Valley. On their return, they modeled the Texas-Mexican Railroad complete with engines and passenger cars. They were both tragically killed in an automobile accident. Their sudden loss was a shock to all that knew them and they are sorely missed. Beverly and her husband Allen joined the club in the early 90’s. There were excellent modelers and very active in all aspects of the club. 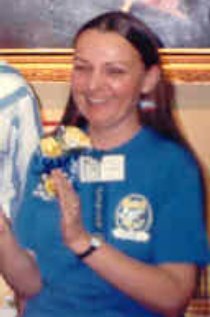 She served as club Secretary in 1989 and 1990 and as Train Show Co-coordinator in 1991. Beverly created a beautiful farm scene for one of the club’s corner modules. She and Allen travelled together to and photographed the Rio Grande River Valley. On their return, they modeled the Texas-Mexican Railroad complete with engines and passenger cars. Dr. Moore was a physician at the Veteran’s Administration Hospital in Temple, Texas. He was a true model train collector and owned some very nice Lionel trains. His knowledge of model railroading was an asset to the club. He helped the club meet many other train collectors. His expertise and experience are sorely missed by the club. Agnes and Ernie Hansbearry were both elderly when they joined CentraMod. She was always at Ernie’s side and helped him with his model railroading. They loved trolley cars and she and Ernie created an award winning trolley module that was part of the CentraMod layout. She and Ernie always made the out of town train shows that the club attended as long as they could catch a ride with other members. Many times their daughter, Joyce, would either take them to the out of town shows or meet them at the show. Agnes was very cordial and always helped the other ladies of the club with refreshments or whatever they were planning. Her life was a blessing to everyone that knew her. Agnes and Ernie are pictured here with Ed Neill in the background. Harold and his wife Ann were charter members of the Club. Harold was a World War II veteran and served as a member of a B-25 bomber flight crew on various combat missions. After the war, he signed on with the Missouri Pacific Railroad as a mail car clerk. 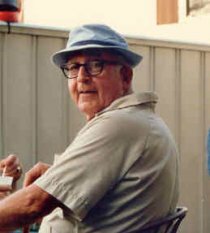 He was a loyal railroad employee and loved trains and model railroading. Naturally, he modeled Missouri Pacific. He was always looking for models of the Texas Eagle passenger train. Most hobby shops only carried the Colorado Eagle, but he was insistent on getting only the Texas Eagle. Harold was easy going and easy to talk with. He had a happy personality and was so glad to see a train club being started in Temple, Texas. He was always eager to help out at the Temple Train Show and enjoyed helping the dealers and visiting layouts set up. He had a layout in his garage and invited the club to his home for meetings in Troy, Texas. Located next to the Missouri, Kansas, and Texas Railroad line that ran between Waco and Temple, Texas, every time a train whistled during a meeting, everyone would run outside to see the train go by. Harold was a real asset to the club and is missed by all that knew him. John was a charter member of CentraMod and joined the club in his seventies. 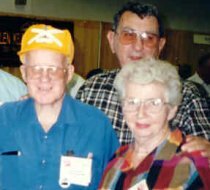 He and Harold Adams were good friends and shared the hobby of model railroading together before joining the club. He retired from the Air Force, and while a very quiet spoken man, he was also very friendly. His health was not good and he walked with a cane. Nevertheless, this did not deter him from doing all he could for the club. He was always at all the meetings and events he was able to make. Illness claimed John’s life a short time later so a lot of the club members never got to know him. 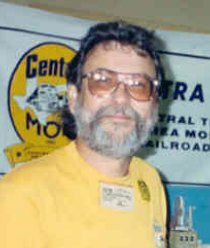 We lost a fine railroad modeler.